Welcome back for yet another session of My Favorite Things Camp Create. This time the focus is on Remarkable Resist. That’s great because it fits Marker Pop’s Challenge #101: Embossing. Well, that gets me another badge and half way through the camp sessions! I’ll be back tomorrow to post the rest. I’d be happy if you’d stop back by! This entry was posted in Any Occasion Cards, Cards, Friendship Cards, Papercraft, Thank You Cards, Thinking of You Cards and tagged Emboss Resist, handmade cards, ink blending, MFTstamps, My Favorite Things Lace Background, My Favorite Things Simply Fabulous Sayings, Papercraft, rangerink, Resist, sssmchallenge, ssswchallenge, timholtz distress inks by dannscraftingwhims. Bookmark the permalink. Thanks for popping over to my blog to say hello!! I am glad to have an opportunity to visit you and enjoy your fabulous projects, D.Ann. Since I subscribe by email, I look at what you’ve made when I receive an update but don’t get over here to comment often enough! You have such a free hand with colors that your cards and other projects always look gorgeous! You also have a refined elegance to your crafting that just puts anything you make a notch above everything else. LOVE seeing your work!!! This beautiful card is just stunning. I am totally in LOVE with emboss resist and I should do remember to do more of it. That lacy stamp is exquisite and you have shown it off to perfection with the bright DI colors you used. Also, I personally love the drama that black matting gives to cards, so that attracts me to this card, too. So gorgeous. I always love it when I see you entering the MFT Camp Create or the PTI events because I know I am in for an extra-special treat when I visit your blog!!! Thanks for sharing all your awesome projects!!! this is adorable, luv the colors and design! I am so glad you played along with us at simon says stamp wednesday challenge! SO pretty! I love the gorgeous rainbow background. Thank you so much for playing along with us this week over at the Simon Says Stamp Monday Challenge Blog! D.Ann….this is fabulous! 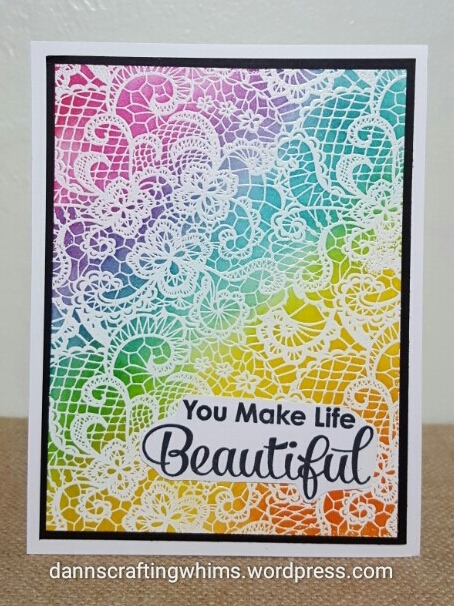 I love that lace stamp background, and the rainbow colors give it a whole new look. Just gorgeous!